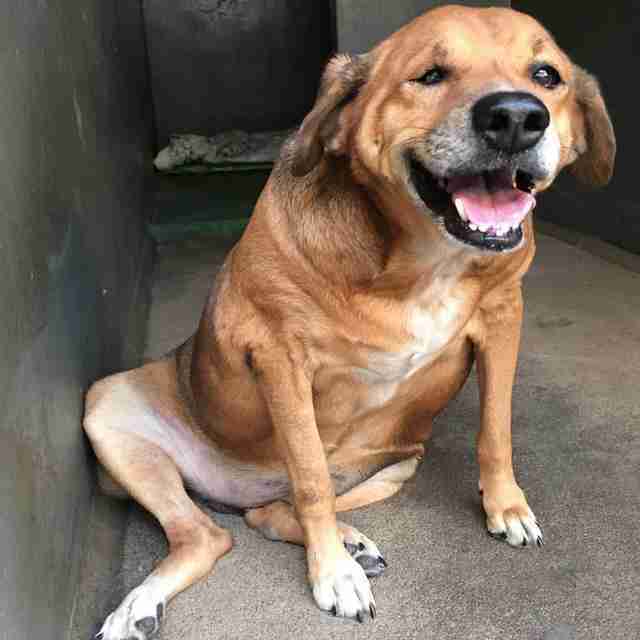 A sweet stray dog named Bolinha has been given a fresh start at a new healthy life after being rescued from a lifetime of being overfed - but under-loved. 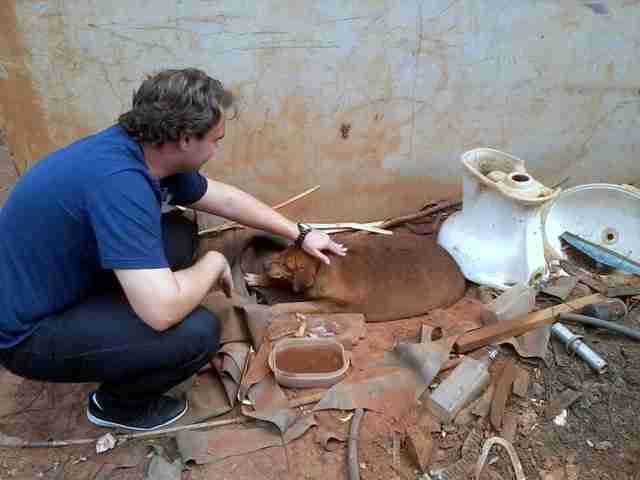 When he was only a puppy, Bolinha was abandoned at a remote gas station along a rural stretch of road in western Brazil. Over the next 13 years, the dog lived in squalor outside the facility's cafe where he subsisted off discarded scraps and handouts from motorists who stopped for gas. 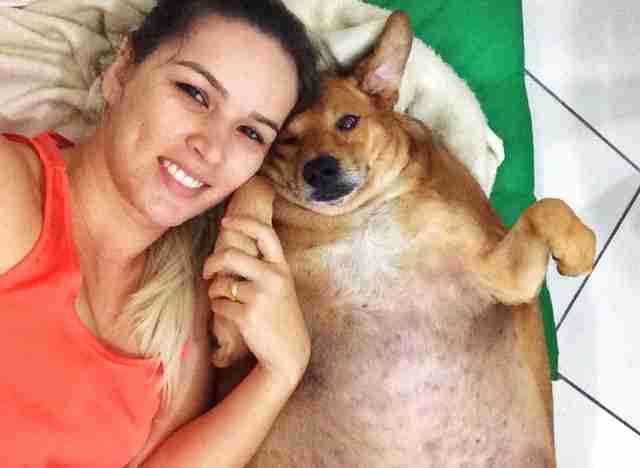 With no one taking care to keep his diet healthy, Bolinha became obese from the too-frequent feedings -- ballooning to a whopping 80 pounds. He is said to have become an "attraction" of sorts at the gas station, but what he needed was much more than the fleeting affection of people passing through. 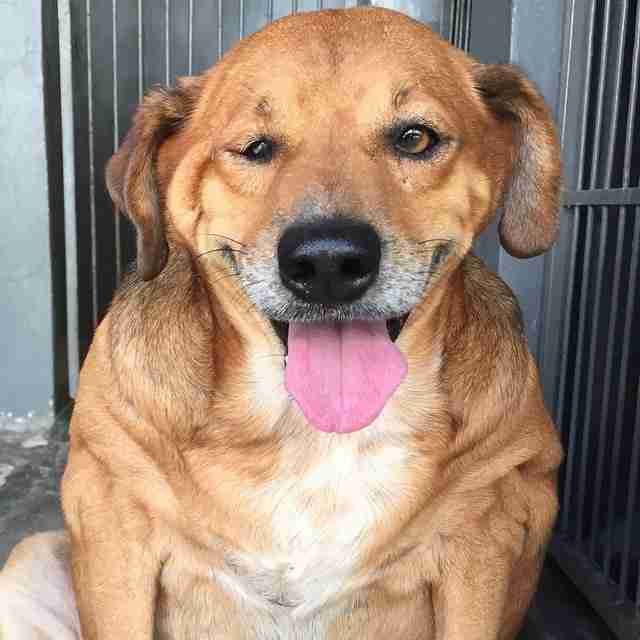 After being overlooked countless times, hope finally came for Bolinha last September after an animal rescuer from a nearby town heard about his plight. 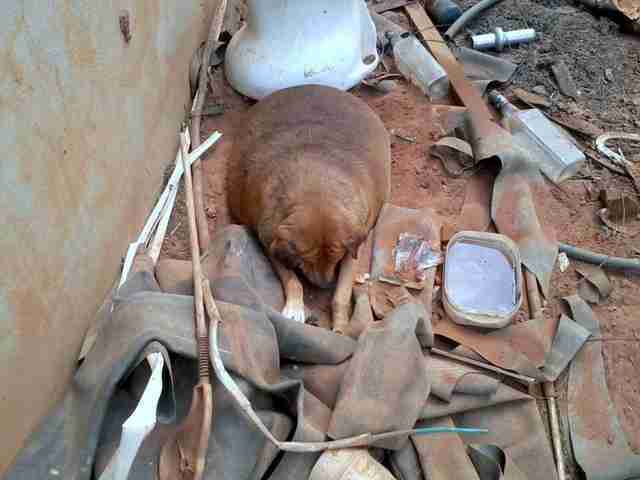 The dog was found huddled amongst a pile of debris behind the gas station when the kind man arrived to save him. He was so heavy, breathing had become difficult and he was barely able to walk on his own. That's the moment everything began to change for the old dog. 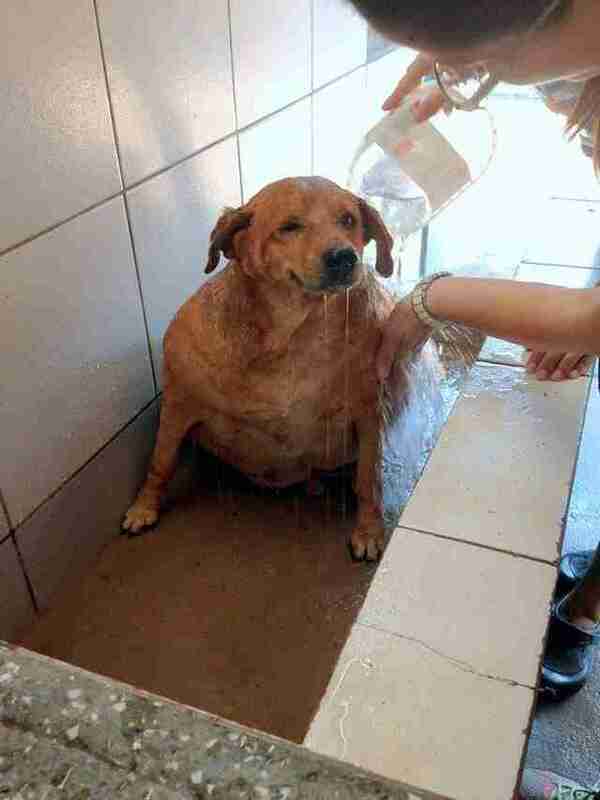 He was placed in the caring hands of folks from Animal Protection Organization (OPA-MT) who gave him what may have been the first bath he had ever had. Bolinha seemed to enjoy the experience. Another first for the neglected old dog was the chance to feel safe and protected. He seemed to relish the company of his kind caregivers who realized that, while he may have been overfed, he was starved for something else: love. 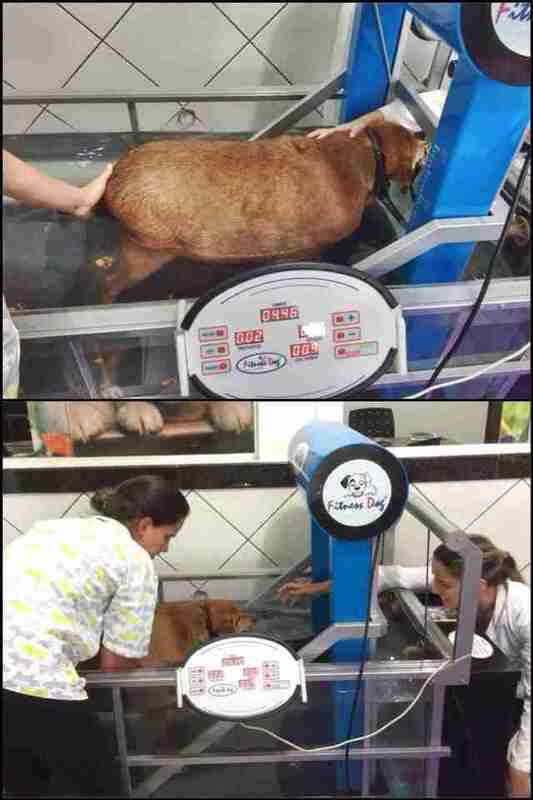 Although so much had already improved for Bolinha, his rescuers knew that in order for him to live a long and happy life, the excess weight that had burdened him so long would need to come off. 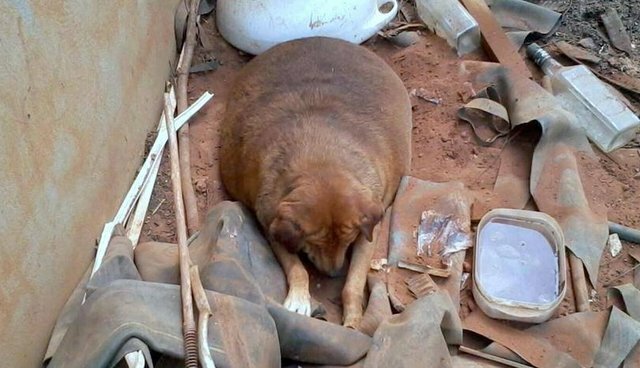 Undoing the damage from those many years of being overfed wouldn't come easy, but with the encouragement of his new friends, Bolinha persisted despite the challenges. He was given an exercise regimen that involved walking on a treadmill in water to alleviate the stress on his aching joints. 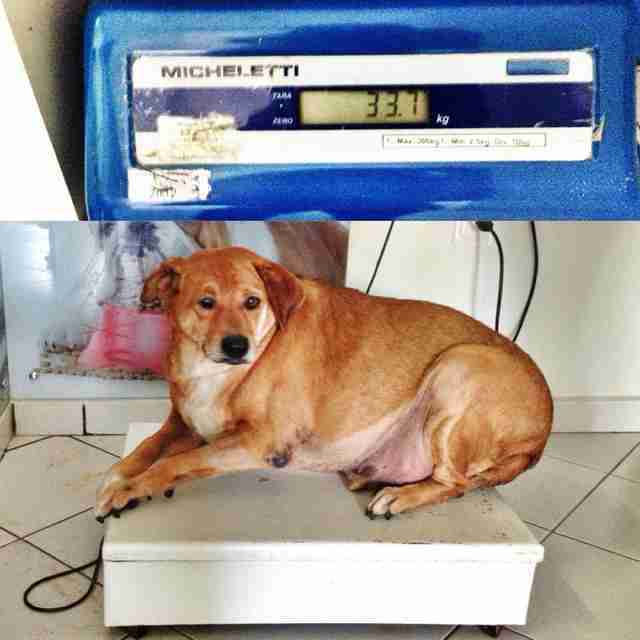 Progress was slow at first, but sure enough Bolinha's extra weight started to melt away. Meanwhile, while his food intake had to be reduced to much lower than he'd grown accustomed to, caregivers made sure to fill the void with no shortage of affection. In time, a happier new Bolinha began to emerge - growing healthier and stronger with each passing day. 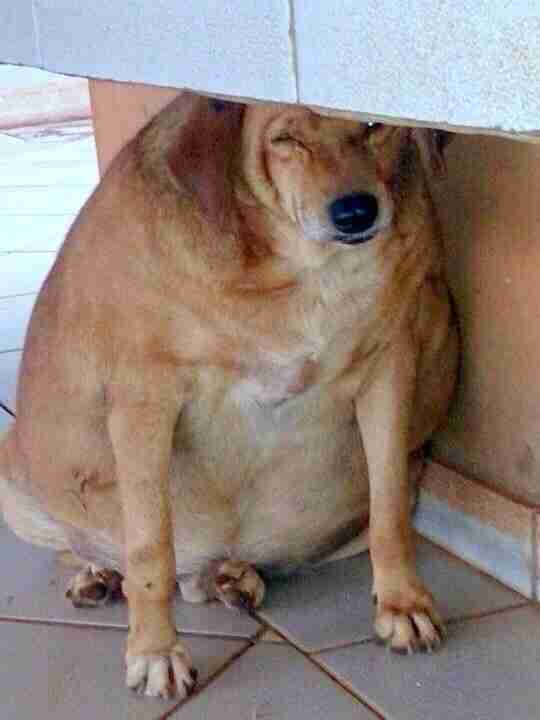 It's been less than a year since the obese dog was rescued from his lonely life in the place where he'd been abandoned, yet so much has changed. Bolinha has so far shed more than 30 pounds - no small feat considering his age and condition. Rescuers says that's still some ways off his healthy goal weight, but the old dog is nearly unrecognizable in both body and spirit. 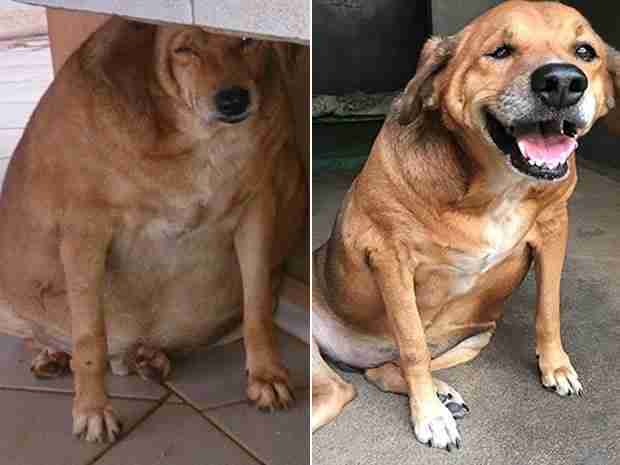 In the coming months, Bolinha's caregivers are hoping to help him lose another 15 pounds, completing a transformation which is already nothing short of stunning. We have no doubt he can do it.